Since I don’t have all the photographs of the weekend yet, I am now posting what I was supposed to post before I left for the weekend but had no time to do it. 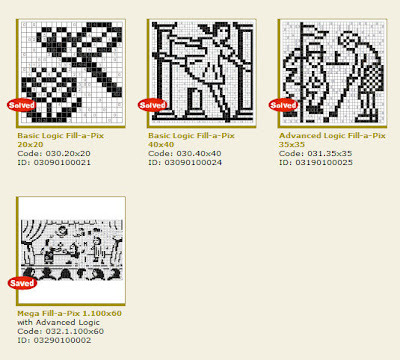 Friday is the day of the week when Conceptis updates the weekly puzzles. I did not show in my last post about My Conceptis what the pages look like when I have solved some puzzles. These are now old and I think I can publish them without anyone being irritated to see the solutions before solving the puzzle. Very many, I think most, of the solvers don’t even want to see the title when they start solving. Part of the fun is seeing the pictures getting recognizable during the process. Some people think that some puzzles are not clear enough to see what they are supposed to represent but I have had enjoyable moments figuring that out. All makes sense in the end but if I have some idea in my head in advance, I have had very hard to change that. Thinking out of the box is the clue; like interpreting hidden images. Usually looking at the picture very far helps. 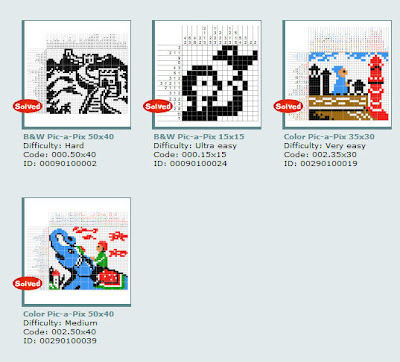 Here are the pages of the online puzzles and they show all the puzzles I solved or started to solve. I love these thumbnails. Now I can see immediately what is solved and what the rating of the puzzle is. 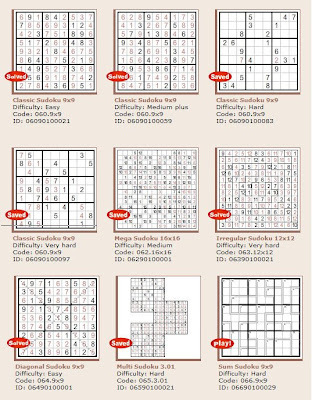 Sudoku’s have lots of unfinished puzzles. 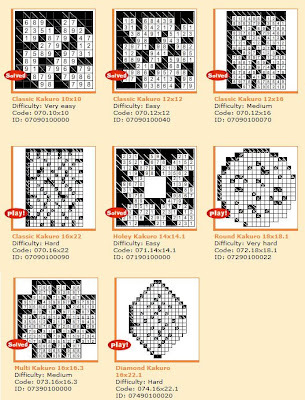 I usually start with the variants because I think normal 9x9 Sudoku’s are a bit boring. When I know I don’t have much time I take an easy one. Because of time issues I have lots of unfinished puzzles here. The sum Sudoku is not my favourite and I solve that only if all the others are solved. These are the Kakuro’s and I finished 5 of them. This was the type I have been avoiding because I don’t like to do arithmetic on my free time. Now the game shows me the possible combinations and I can solve these with pure logic! 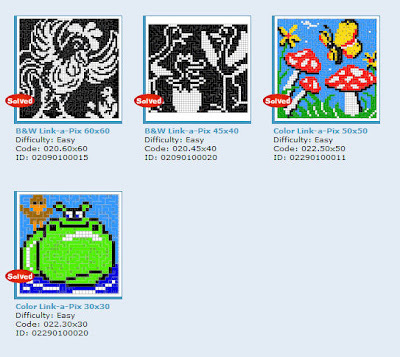 I started with the easier ones and had time to get to the medium stage. I printed the Battleships and Hitori’s on paper for the trip. I was solving them when we got out of the route.